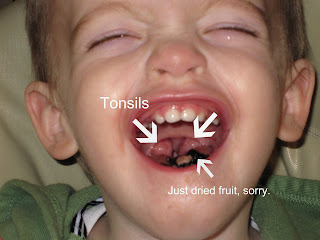 The picture below is a picture of Sean's tonsils. Do not view this if you have a sensitive stomach. We meet with the ENT on Thursday to see if he needs to have them removed, but as you can see from the picture, they are seriously enlarged. Please excuse the food in his mouth. I tried to get it out, but couldn't get a picture of the tonsils otherwise!